The Wall Lasiommata megera loves hot, sun-baked, dry ground and gets its name from its habit of basking on walls. So when I went looking for it up on Morgans Hill I headed straight for the chalk quarry in section 15 where I’d seen one late last year. On the way to the gate I noticed a patch of bare ground to the left of me, just in front of the fenced off juniper bushes and almost immediately a flicker of brown dropped down onto it. Was it really going to be this easy? I walked over slowly, spooking myself and a grazing rabbit as I got closer. Yep, it was a Wall, tricky to spot at first as it had its wings folded rather than outspread in classic sunbathing pose. As soon as it saw me though it danced off down the hill but then doubled back and landed again. It repeated this pattern several times as I attempted to get a photograph, obviously keen to defend its territory, so I lay down on the grass and simply waited for it to return. Although it did briefly open its wings on landing it always closed them again before I had time to focus, so I opted for this side view. 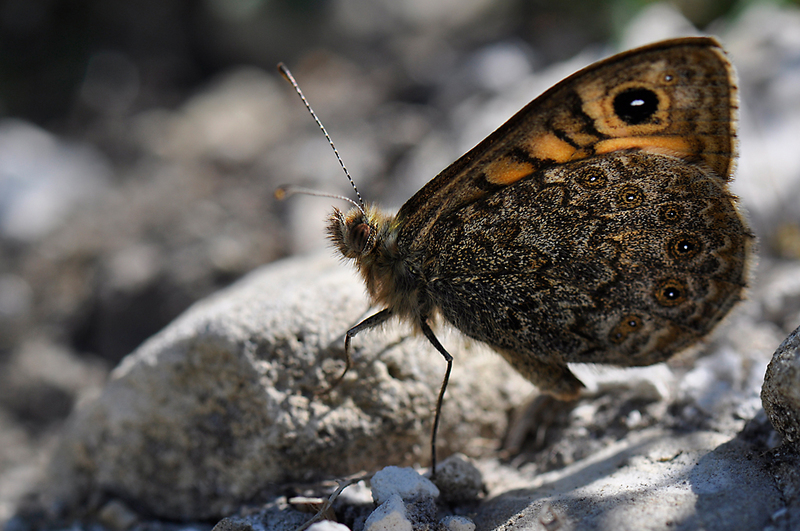 The undersides of butterflies are often overlooked but as you can see they can be equally impressive.